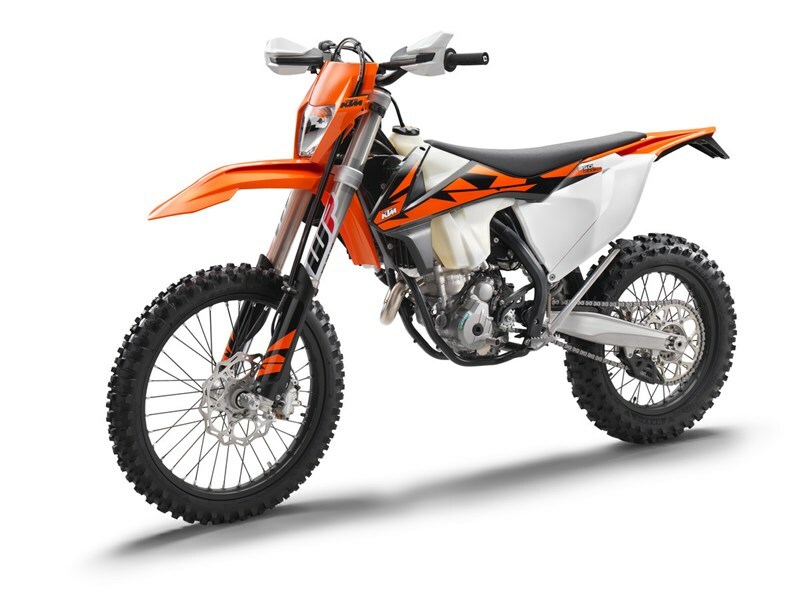 The KTM 350 EXC-F engine features a design with similar dimensions to the KTM 250 EXC-F, but delivering 450-style torque and power over the entire rev range. The architecture with an optimized shaft configuration makes for excellent mass centralization and effortless rideability, at only 63 pounds. That’s including the comfort of an E-starter. This makes the KTM 350 EXC-F brilliantly suited to adventurers looking for the ultimate combination of power and weight. The KTM 350 EXC-F’s crankshaft utilizes a short connecting rod, making for an overall compact and lightweight engine with a snappy power delivery. A plain big (bottom) end bearing with two force-fitted bearing shells runs directly on the crank pin. This design is a must for the extremely high engine speeds and the unrivaled power of this 350cc engine while also enhancing the engine’s durability for long crankshaft service intervals. The KTM 350 EXC-F is now fitted with an E-starter as standard, which is a clear advantage when it comes to crunch time in the heat of battle. A strong starter motor made by Mitsuba will fire time and time again at the push of a button. Even under extreme conditions, thanks to its heat resistant O-ring. The engine is fitted with a precise 6-speed Enduro transmission, with solid shift engagement thanks to a special low-friction coating on the shift forks. An advanced ´No Dirt´ gear shift lever design prevents mud or dirt build-up in the joint for trouble-free rides. In MY18, the transmission shaft gets a new bearing that has a bigger overlap in the case. This means reliability even under extremely hard conditions. Inside the cylinder, with a bore of 88mm, thumps a reliable box-type piston made by CP. Its crown geometry is adapted perfectly to the high-compression combustion chamber (12.3:1), where its rigid structure and low weight maximize performance. Thanks to low oscillating masses, the engine revs freely with plenty of power. The design of the die-cast crankcases allows for a centralized shaft configuration, moving the crankshaft close to the bike’s center of gravity. This means quick and agile handling. The engine covers feature an advanced surface structure to reduce the wear caused by the rider’s boots. The KTM 350 EXC-F employs the KTM-developed DDS clutch (damped diaphragm steel) with a wear-free steel basket and extremely heat resistant clutch plates and new, nitrated steel liners. This clever design employs a diaphragm spring instead of the usual coil springs, making for considerably easier clutch action. A diaphragm spring also leaves sufficient space for a damping system to be integrated into the clutch hub. The goal is traction, but durability is as well. Light operation and telepathic amounts of control are standard with this hydraulic Brembo actuated clutch. The high-tech, lightweight chrome-moly steel frame has a knack for easy handling, outlandish rideability, precise cornering and excellent stability. You can also count on high torsional rigidity and low longitudinal stiffness. This results in better absorption of the energy created from the front and rear suspension, sucking up jumps and bumps. In short: more comfort and less rider fatigue. Laterally attached, lightweight aluminum engine head stays (the connection between cylinder head and frame) contribute to precise cornering and a reduced vibration level. The engineers could pull off all that, while keeping their frame 2.2 pounds lighter than that of the lightest competitor on the market. In addition, it is easier to maintain, easier to work on and supplies more space for the tank and other components. The bike also features an extra-light subframe made of strong and lightweight aluminum which tiptoes the scales at less than 2 pounds. The WP Xplor 48 upside-down fork is a split fork developed by WP in close collaboration with KTM. It is fitted with a spring on both sides but features separated functions for each fork leg: compression damping is fitted on the left side, while rebound is on the right. So the forks can easily be adjusted with the twist of a dial on the top of the forks. New outer fork tubes and a reworked setting make for more sensitivity, improved damping behavior and a reduced weight. In addition, a sealed hydro-stop guarantees excellent resistance to bottoming-out. Due to high-quality materials and a state-of-the-art production process, the new WP Xplor 48 fork – with approx. 300mm of travel – has outstanding response and damping characteristics. A comfortable preload adjuster (standard for SIX DAYS models, retro-fittable for standard models) allows for a simple spring preload setting in three steps without tools (standard à +3mm à +6mm).